She is a gorgeous bride that reflects eternity, married to the majestic mountains of the Himalayas and protected by his countless siblings. All this is located in an obscure corner of our planet in the vicinity of the Indian Tibetan border. Geographically it is located in the state of Jammu and Kashmir, India. She is Zanskar, a river fostered by pristine water springs flowing down from the Himalayas for centuries, streaming in her ladylike gentle gesture. 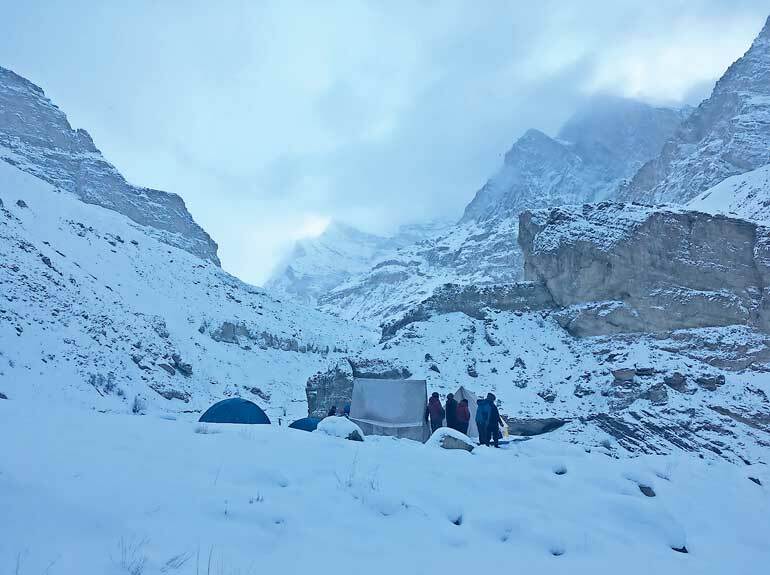 In winter she converts her surface to a hard sheet of see through ice (Chadar) which becomes her lily white dress welcoming you to walk on her wedding veil sprinkled with silver crispy snow, which becomes a journey of a life time called the “Chadar Trek”. In the hours of sun, her ice surface imitates the mirror image of the mountains and the blue skies. In the hours of darkness, you have the milky way to gaze upon, sending you into a trance to keep your mind off the minus 40-degree temperature. On the day of a full moon the entire land scape drowns in deep chilly silver. On her sullen days she begins to melt away and the “Chadar” (ice surface) becomes thin. This is when you find it difficult to cross the river. As the minus 30 waters touch your skin, your feet and finger tips go senseless. 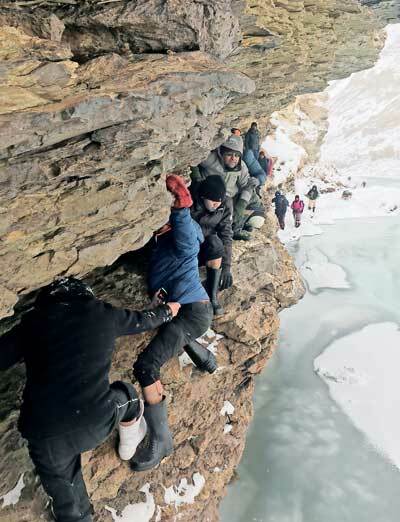 If Zanskar gets angry she makes her flow go faster and makes the intruders climb rocks in the valley wall edging higher on the mountain with nimble feet and frozen hands which happens to be the real feel of the adventure. The mountain tips are covered with snow like a bride covered by her veil. They make her skin softer as she remains untamed and unchanged. You may feel light headed and nausea may strike but do not be surprised because even Zanskar the virgin bride too feels an uneasiness of the intruder. Your body needs day or a two to acclimatise to the low temperature in the air you breathe and the coldness that surrounds you. The total walk is 75 km, to be covered within eight to nine days. It sure is a challenge, but worth the effort. If the weather is in your favour, you will see a frozen water fall in Nerak, the last destination of the hike. You may reflect upon your life while walking as Mother Nature talks to you in her own way. At times there is a hope of coming across meditating monks who seem to know in depth what life is all about. At night you can pour out your stories gathered around a simple bonfire with your porter crew to keep your mind off the freezing temperatures. Apart from a thousand absolutely pictorial views that entertain you there is always the gestures of people you meet, of overlapping moments of generosity, compassion and kindness. At the end of the trek disobedient kids like us celebrate the beauty of the adoring Zanskar bride with a holy dip in her waters which is way below the freezing point. A sure test for the functions of the nervous system. 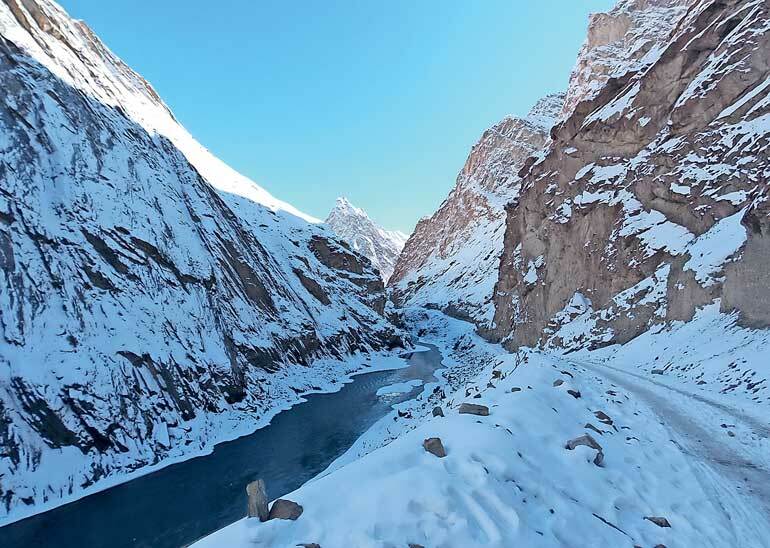 The Chardar trek was recommended as one of the best 20 treks on the planet by National Geography in 2014 and CNN reported saying “Chadar: Is this the end for the ‘world’s wildest trek’?” in 2015. The Chardar trek is a real test of your physical and mental fitness levels as the route will teach you many lessons of uncertainty. Things get delayed and plans get changed. Roads close down without prior notice, landslides, altitude and sickness are just few uncertain hurdles which become certain as the trek begins. No mobile or data connectivity for status updates in social feeds but the trek makes the best ever connection with you. Most importantly you connect with your inside, your one true self. Sometimes flights get delayed for few days so keep a few extra days to arrive or depart from there. But she is a darling bride expensive for many mediocre excuses. A kiss from her is a priceless gift of a lifetime. Undoubtedly she may be waiting with her divine kiss for humble hearts like you and I but remember to leave her untouched with your scars as she remains a virgin of a million years. If you are convinced let’s dive a little deep in Zanskar. She is not only a virgin bride with absolute beauty but a mother of approximately 15,000-20,000 beating hearts pumping in a lower frequency comparatively to you in rupees and cents circulation. Habitants of the area have copied her name for the region in deep appreciation of her service for hundreds of years for the livelihoods and eco systems. The region Zanskar covers about 7,000 square kilometers and the capital is Padum. The Zanskarians have mastered the art of customer service and richer by far in magnanimity. Your trekking guide and the porter crew are Zanskarians. They always grin and smile in the hard chilly weather and say “Jule Jule” their version of “Ayubowan” in their mother tongue. Our trekking guide, Dadul was a rare breed from Zanskar a 28-year-old graduate from University of Chandigar who had studied political science, geography and European political history. During the trek we left him with many tight decisions for his call. Once my 10kg back pack swam in the Zanskar water while I was fighting for my life with numb feet and fingers as we were rock climbing to cross the river. Dadul and his core pilot Sonum jumped and rescued my shivering back pack that dripped water like tears. Surprisingly dripping water tears converted to powdered water crystals in less than few minutes. So sadness is a distant feeling in delightful Chardar and you indeed will feel strong for taking such risks in life. The porter crew will be your parents during the trek and the warm vegetarian food they serve with the view of sheer mountains will bring you a feeling of guiltiness on the amounts you spent for five course meals at so called five star hotels. Their menu of soupy noodles, roti, dhal curry and the morning spice tea is mouthwatering. But you need your dry foods and energy bars to fuel and keep your momentum going. 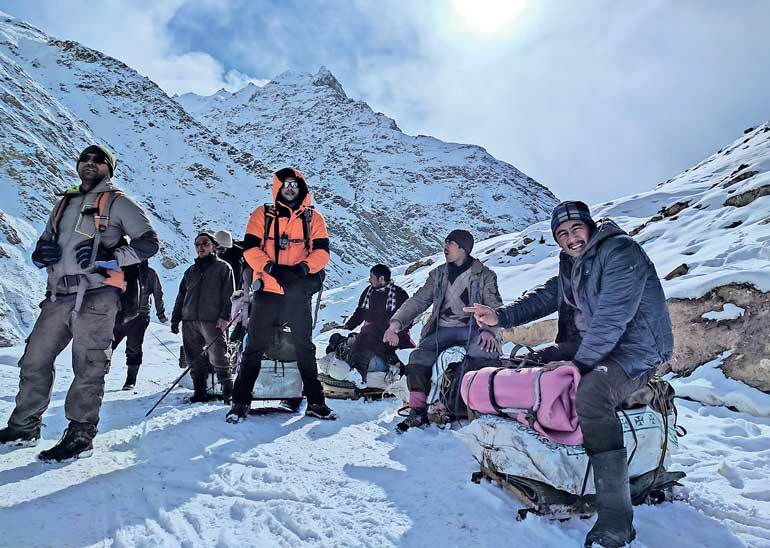 The porters will carry your food, tents and extra oxygen in case of an emergency in a sleigh like what Santa Claus rides during the Christmas season. But the life of a porter is far from that of Santa Claus but, I still wonder how they are so humble and hard working with smiles always on their faces. Under the bonfire they tell stories of snow leopards, kiangs, bears and wolves in the area but they are hard to spot during the trek. You will spend all your nights under camping tents and caves. You may enjoy many minutes of solitude with zero disturbances feeding your heart, soul and mind with positivity and possibility. The Zanskar bride is so pretty and mesmerising that you forget other priorities and worries that plague you. All trekking routes in the world are graded in three tiers. Easy, Moderate and Difficult. Chardar trek is indeed difficult but only if you think so. You need to produce a medical report before you embark on the trek and place your fingerprint on a paper taking the entire responsibility of your life but I must say the Zanskar bride is soft, gentle and kind in her own ways. The precious minutes of dancing like six-year-old kids on the see though glass of ice surface, snow throwing and the scare of falling down the slippery steps are indeed very rich memories. Zanskar will guide you passing Tilat Sumdo, the base camp site, and Shinra Koma, an array of mountain ranges. Tibb is another destination you will cross with cascading waterfalls and mysterious Himalayan caves. Our trekking team was a 10-member group, all strangers to me except my university rugby team mate Vishnu from Sri Lanka. At the end of my adventure I ended up with eight new friends from India and a river of stories longer than the white snow veil of the Zanskar bride. Zanskar is a source that teaches lessons for life, offers a diversity of climate moods and a spectrum of vivid scenery. She will never dilute her prestige and her class is very expensive to buy. But her life is simple and affordable. She doesn’t discriminate gender so Jayanthi’s generation of Sri Lankans are welcome. She is open to the rich and the poor, foreign and locals alike and remains loyal to everyone. That is why she will always be a gorgeous virgin bride where all men and women fall in love at first sight.